Yesterday I finished the September a Challenge quilt for the Small Quilt Talk group. I am really enjoying making all my little SQT challenge quilts out of vintage fabrics. I made my mini much smaller than the original pattern by Kathy Tracey. Her version had 16 4 patches in the center and mine only has 4. It measures 9 inches square. 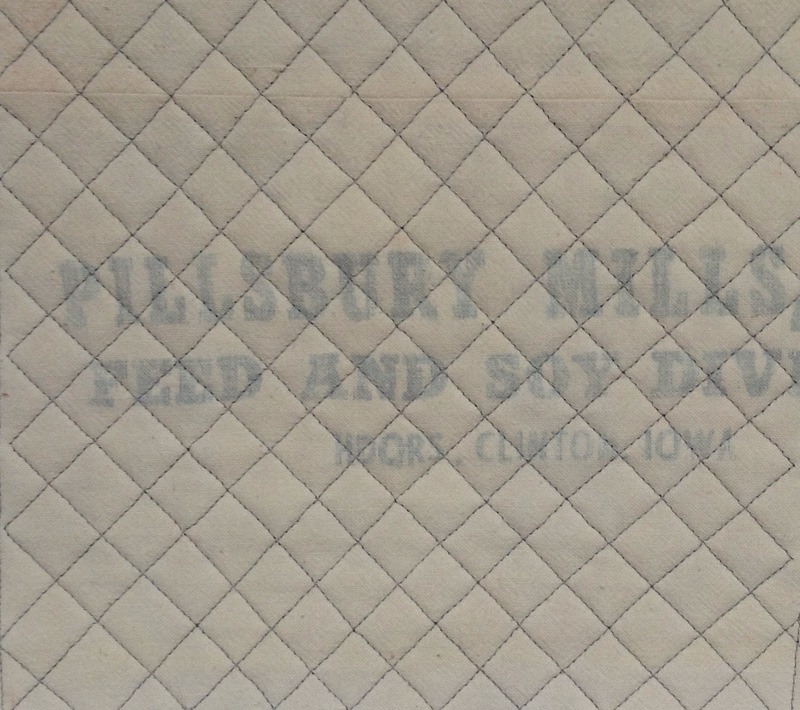 I used a vintage feed sack for the back again and quilted with gray thread. I am still working on the QOV on the frame. It is slow going so a little mini quilt makes a fun break (or is that procrastination?!?). 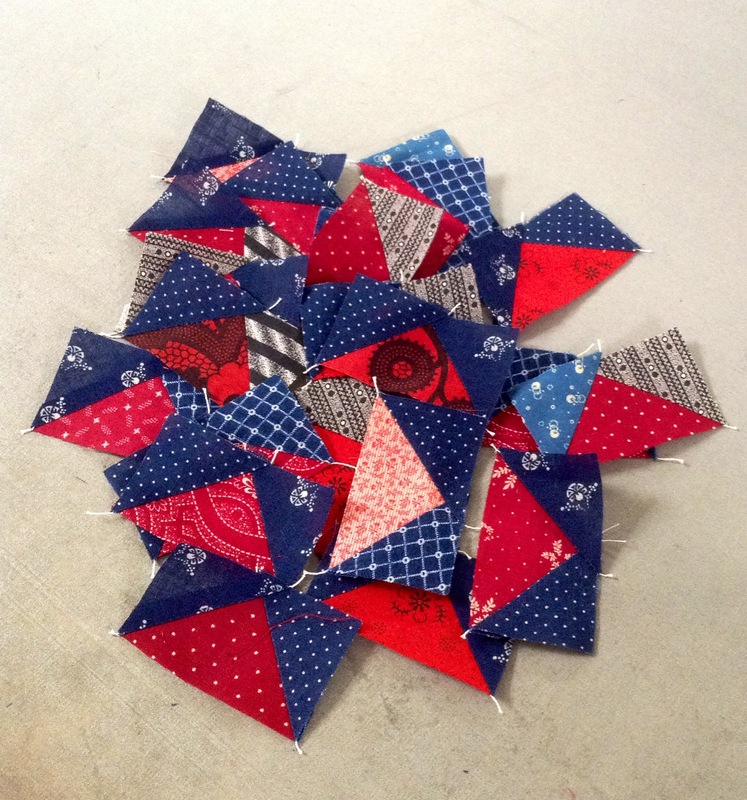 Linking up with Kelly at My Quilt Infatuation for Neede and Thread Thursday. This entry was posted in Doll Quilts, Finishes, Miniature, Small Quilt Talk Group, Uncategorized, Vintage Quilts. Bookmark the permalink. Love your mini. The backing is perfect for it. Great use of vintage fabrics. 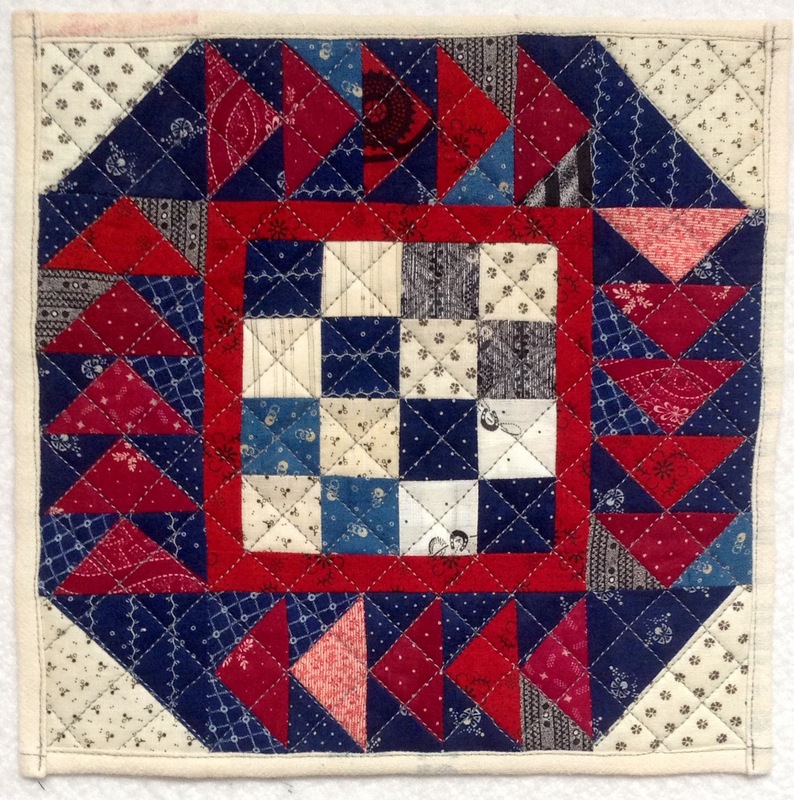 THis is an adorable little quilt – and it may be procrastination BUT I think you need to do what you need to do – you will get to the avoided task when you get to it – meanwhile your soul is being bathed by producing something quickly achievable and beautiful – I firmly believe in letting my heart tell me what to do! 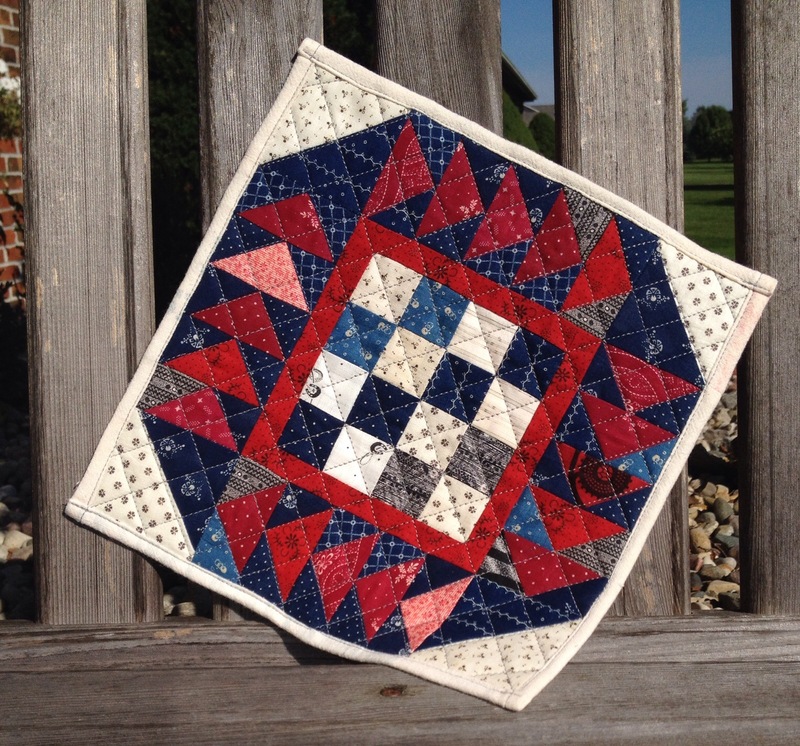 this one is just so adorable I love the way you quilted it too! Oh Katy! I am in the online group, too, and always look forward to seeing the quilts that you make. This one is so cute! I always hand quilt mine, but may machine quilt a grid like you did. Looks great! Visiting from My Quilt Infatuation. Lovely little finish. Feels so good, doesn’t it? I love that little quilt! Adorable! 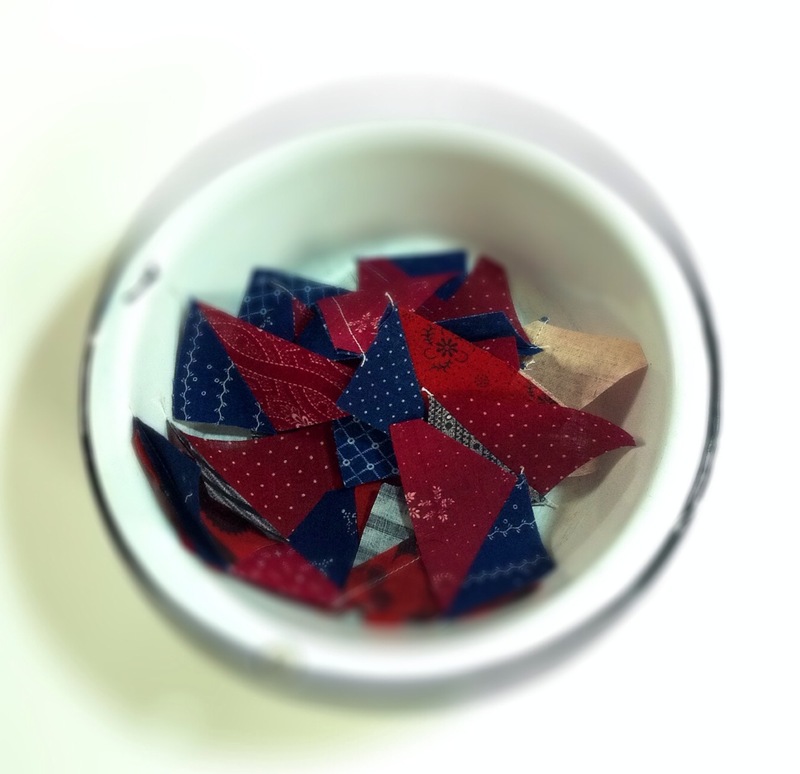 Did you use dies for the flying geese?